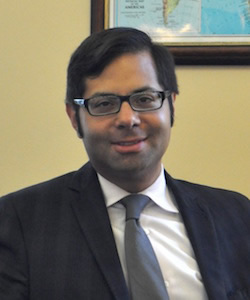 Leonardo Martinez-Diaz is deputy assistant secretary for the Western Hemisphere at the US Treasury Department. Previously, he served as director of the office of policy at the US Agency for International Development, where he was responsible for development policy formulation and analysis. Prior to that, Martinez-Diaz was a fellow and deputy director of the global economy and development program at the Brookings Institution. He has also served as deputy director of Brookings’ Partnership for the Americas Commission, consultant for the International Monetary Fund, and director of the high-level commission on the modernization of World Bank Group Governance. Martinez-Diaz received Master of Philosophy and Doctor of Philosophy degrees from Magdalen College of Oxford University, where he specialized in International Political Economy and was a Marshall Scholar. He graduated with honors from Northwestern University with degrees in Economics and Political Science and was a Truman Scholar.